We are currently in the process of supplying and installing 15 generator sets, together with lighting towers, for a large-scale outdoor event for a major blue chip company based at Somerley Park, near Ringwood, Hampshire. CES Electrical not only carry out several logistical site visits, to ensure that everything runs smoothly but also dug trenches for underground cables where they were required as specified by the client. 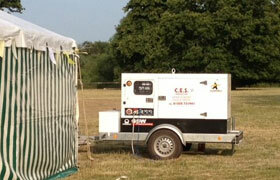 “Working to a tight schedule CES delivered and installed over 15 generators working through the night to ensure works completed prior to event nothing was too much trouble”.